« GIVEAWAY: SECRET DIARY OF A CALL GIRL Prize Pack! 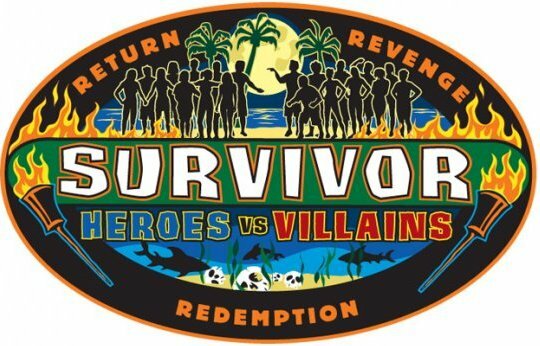 SURVIVOR Heroes Vs. Villains Castaways! 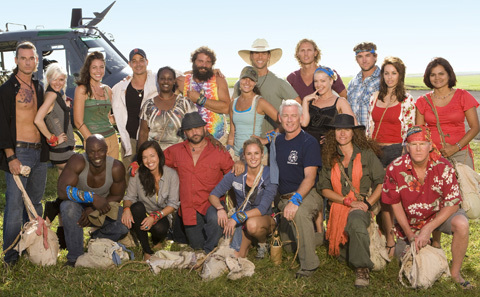 I don’t know about you, but there’s something about an All Star season of SURVIVOR that always makes me really happy. I love getting to see some of my favorites again, and see how they interact with others, see how they change up their game if they didn’t win last time, or if they did win. I do doubt some of these labels of Hero and Villain (Is Sandra a Villain because she’s a past winner?) Check after the jump for pictures and descriptions of the two tribes and let me know what you think! What I remember about him? He’s basically a land pirate dressed in rainbow tie-dye. He’s got an “aw shucks” likeability, but he’s not necessarily a great strategic player. He’s just so damn likeable! What I remember about him? That he’s a grave digger, for one thing. Another is that he had two different immunity idols and NEVER played them! Also, that he flirted with Parvati and was taken out of Micronesia when he got injured! 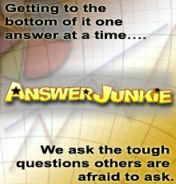 Interesting tidbit about James? He’s a HUGE fan favorite and won back to back Fan Favorite prizes on his seasons! What I remember about him? You mean besides his incredible good looks? The fact that he would have won if he had taken Keith to the finale, and that he was totally out of his league on All-Stars. That doesn’t mean he isn’t one of my favorite past castaways. I would really like to see him do well! What I remember about her? I remember her being completely out of her league when both seasons she was on started. But I remember thinking she was awesome, and totally respectable and even though she kind of convinced Erik to give up his immunity even though he never should have, she still came out with a likeability that other “backstabbers” don’t have! What I remember about her? Her romance with Ozzie on Micronesia, maybe. Or the fact that she’s come so close two times because she’s actually a great player of the game! She just cannot seal the deal because she doesn’t have a good Final Tribal Council attitude. Part of me wants to see her win this whole thing because she deserves more than 2nd place on her third try!! What I remember about her? She can’t keep an alliance to save her life. Not because others turn on her, but because she abandons people in an effort to do better for herself. I will never understand why so many people were Anti-Sugar in her season, because I thought she was a good player, and a likeable enough person. Sure, she cried a lot, but you might too if you spent like all of your time on Exile Island…. What I remember about her? That’s easy. She was LITERALLY the last person standing on her team in Palau and she was sadly picked off immediately when she was folded into the other team. Her incredible performance let to another great performance in Guatemala and she totally deserves the win! She should have taken that season, too, but people didn’t seem to like her as much the second time around! What I remember about him? I gotta be honest, I remember not liking him as much as just about everyone else watching the show. Something about him rubbed me the wrong way, and I didn’t think he should have been the ultimate winner. I’m not sure who should have won his season, but oh well! He’s back again and I don’t know that he has a strong enough personality to compete with some of the people on his team! What I remember about him? I remember being completely smitten with him. Strong in challenges, good with the social play, this guy played a great game, even convincing Ian to drop out of a challenge, and allowing him to sneak into the final two. A lot was made about how people seemed to think that was a problem, and that he did some backstabbing, but I don’t see it that way. I hope he’s still got it, and that he can kick these young kids’ asses! What I remember about her? Nothing. I had to actually research who she was, and then I found out that she was one of the people who chose to deflect to the other tribe in the season that Yul won. Yul’s fearsome team of four went on to take out that other team, and be the final four standing, so Candice’s great idea was ultimately a great mistake. So what is she going to bring to the game? What I remember about him? Hating him. I thought he was absurdly mean to people and didn’t understand why people would ever align with him. I will say that he looks like a combination of my friend Josh and Matthew McConaugHEY, and that he wasn’t actually a bad player per se. I’m just not interested in seeing him play the game again. What I remember about him? That he hated every single person in the world. That he only had his dog to keep him company, and then the dog died, and even that didn’t make him a sympathetic character. That he hated Sugar for not sharing a cookie, and that I think it was all a ruse so people would feel bad for him. I hope he’s gone right away! What I remember about her? That she won, and that’s about it. I don’t remember her standing out as a particularly incredible game player. She sucked in challenges. Apparently, she was so mad about Rupert being voted out, she threw out all of the fresh fish in the camp. Maybe that’s why she’s a villain? What I remember about her? She’s another one that doesn’t stand out. She was the runner up because she beat Cirie in a fire making challenge at one point. But that’s about it. Maybe she’ll surprise us all? What I remember about him? Hating him immensely and then kind of wishing he would win the whole damn thing, because seriously, he had so many people rolling over dead in his wake that I thought it was impossible he’d lose. I also kind of want to se him team up with another person I hate so that I can root for him over them, and then watch him cry when he’s still not voted the winner at the end. The good news for Russell? No one had seen his season when they filmed this, so they know nothing about his gameplay! What I remember about her? That she looks like a snake, and acts like a snake, and thinks she’s beautiful, and really really really makes me hate her for just no reason other than that stupid cowboy hat. Remember when she accused someone of bringing beef jerky? Hope she’s out fast! What I remember about him? That as much as everyone else seems to hate him, he’s one of my favorite players to ever be a part of the show! I LOVED him in All Stars. Loved him on The Amazing Race. Love him and “Ambuh”. Love his accent, love his block headedness, love how he thinks people will still be able to trust him, and really truly hopes he finally gets a win! I will root for Rob whenever he’s on anything, seriously. What I remember about her? I just remember her having a giant mouth, and using her looks to get her way a lot. Sure, she’s won a season, but it’s because she got super cutthroat, versus her first season. She had an all girl alliance at one point, and they, one after one, got rid of the guys, so kudos to her. I just hope she’s out first, and she’ll never come back again. What I remember about him? Before my hatred for Russell, there was my hatred for Coach. God this guy is crazy. He calls himself the Dragon Slayer. He calls Tyson his assistant coach. His family visit was his real life soccer assistant coach. He’s nuts. He thinks he’s this incredibly awesome dude who just happened to get people to trust him maybe because they delighted in is craziness? God, I cannot imagine him and Russell on a team together. What I remember about her? That she got so thin at one point, people stopped talking about her game play and started talking only about her stature. She’s funny, she’s sarcastic, and I remember she kind of hates everyone? Lately, I’ve been enjoying her cast-off interviews with Dalton Ross over on EW.com, because she’s hilarious, and constantly rolling her eyes, so hopefully, she’s a fun castaway to watch this time around! Totally agree with everything you said about Boston Rob. He’s one of my all-time favorites too! Hope he finally pulls out a win.